Deb Stanley Leap '72 and Ruth Smith Stanley '45 celebrate graduation day with Amy Leap '12. 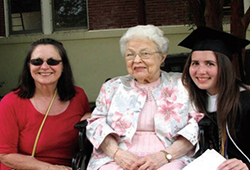 Three generations of Mary Washington women celebrated their special connections at the 2012 Commencement ceremony held in Ball Circle. Deb Stanley Leap '72 escorted her mother, Ruth Smith Stanley '45, from Harrisonburg to Fredericksburg to be a surprise guest for graduating senior Amy Leap '12. After all the pomp and circumstance, the trio met by the fountain between Virginia and Willard Halls. "I saw the biggest smiles on both of their faces," says Deb. "My daughter said, 'I can't believe my grandma got here,' and my mother said, 'I can't believe I made it back here.' It was just incredibly special for all three of us." Now that Amy has graduated, the family happily stays connected to Mary Washington. They look forward to Reunion Weekend activities, and they are invited to campus for special Mary Washington legacy events. A member of the UMW Heritage Society since 2000, Deb also has arranged to establish a named scholarship for biology majors. "When I attended Mary Washington in the late 60s and early 70s, I was on the cusp of a generation of women to break through barriers," says Deb. "My education – including the technical skills related to my major in biology and the ability to speak and write – made me an extremely good job candidate." She received numerous offers for employment right after graduation, eventually accepting a position in a lab for the Commonwealth of Virginia. Her career progressed when she began working at Merck, a global pharmaceutical company. After becoming a mom, Deb leapt back into the classroom and earned a master's degree in chemical engineering at the University of Virginia, and she continued to enjoy her technical career until retiring from Merck in 2005 with 25 years of service. Not ready for a life of leisure, Deb began a new career working in the Communications and Science Disorders labs at James Madison University. Now retired for a second time, she credits many of her professional achievements to her undergraduate education. "My Mary Washington professors were all hard taskmasters," she says, "but they cared, and they would go the extra mile if you put in the effort. And, while I didn't always appreciate my liberal arts classes, I now think they were critically important for me to be able to thrive in the work place." Deb first began thinking about her estate plans when arranging trusts following her late husband's death. "He taught physics at JMU before he was diagnosed with cancer. After he passed away, I set up a scholarship fund in his memory, and I am proud of that legacy," she says. "I also am aware of the budget restrictions that state universities face, so I decided to establish a trust in my name at Mary Washington to help provide extra funding for deserving students." Deb and Ruth are proud to be Mary Washington alumni, but years ago they made a concentrated effort to avoid influencing Amy's choice of colleges. "From the very beginning, Amy was very deliberate and careful about researching colleges," says Deb. "She visited a lot of different campuses, and she apologized when she made her decision because she didn't think I wanted her to go to my alma mater. I remember I did the happy dance all the way home the day she told me she was going to Mary Washington, and I have been doing the happy dance every day since."